Upload a file containing your contacts or calendar. Microsoft Excel, vCard or CSV file formats. For calendars, you can import iCal files. Type your text message, construct your appointment reminder (IVR) or record your voice message using your phone. Run your campaign and then review the reports. Gather data from the questions asked in your IVR message. Reminders are so helpful. Reminders about your dentist appointment. Reminders about schedule changes at work or school. People already know how important it is to keep in contact with their customers, clients and friends. It is our desire to make you realize how easy it is to send reminders. We also wanted to make it very affordable. Reminders for the masses! We are passionate about our service. We want to make you successful. Reminders make a statement about you and your business. It shows that you are connected with your clients or customers. A little reminder really is powerful. What file formats are suppored for address books? What file formats are suppored for calendars? How do I find the URL to my Google calendar? How do I find the URL to my Yahoo calendar? How do I find the URL to my Hotmail calendar? How do I add my own recordings? Can I send text message? What information does an Address Book contain? What information does a Calendar contain? What is the caller ID associated with a text message? Add your Contacts or Calendars. minutes and you will be able to review a report. Type your message and our system will read your message to your clients. You can add the appointments on your Google, Yahoo or Hotmail calendar with just a few clicks. And you can update with your calendar with just 1 click. Easily add your address book data. Just export your data to a vCard file and then import. and allow them to Confirm, Cancel or Reschedule using 1, 2 or 3 on their phone. Upload your calendar and then inject DATE and TIME information in your text messages. Pay only for what you use. Send messages for only a few cents. 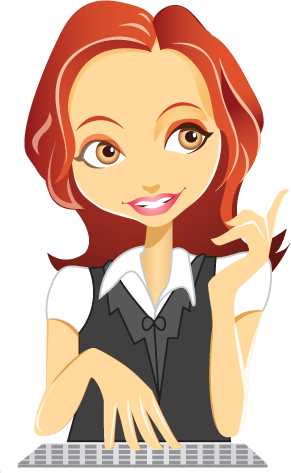 Our support team will answer your question as soon as possible. How can we help you? This video tutorial explains the features of the application, The usage of import contact, sending remainders through text and using voice, the usage of IVR to act as per customer response. 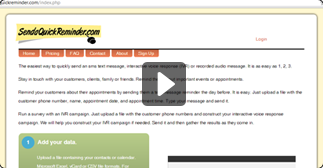 This video tutorial explains the step by step process to Create IVR appointment remainder with sendaquickremainder.com. This video tutorial explains the step by step process to Create vCard upload using sendaquickremainder.com. That is enough to send up to 80 text messages for FREE! It is a great way to try the service without any obligation. Never a monthly fee. Select the Radio Ad link above.